Thanks to George Henning for lending today’s Real Photo postcard of an Augustana College scene. The view is from Rock Island’s 7th Avenue looking southeast toward 38th Street. 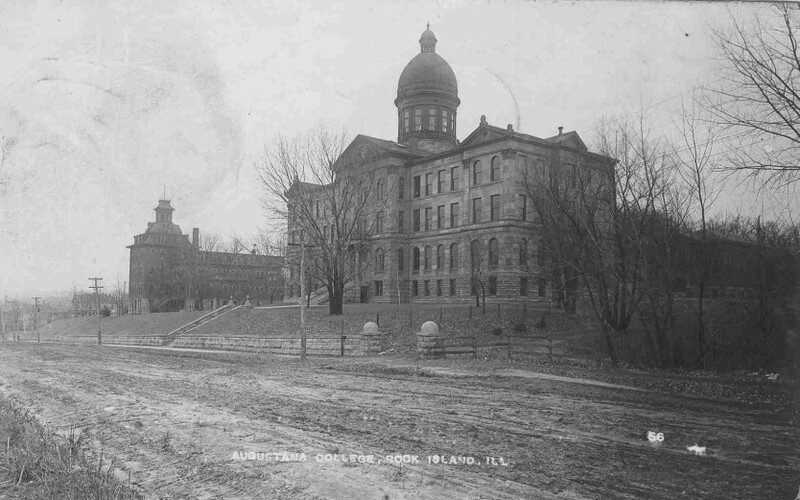 The central feature of the postcard is Augustana’s cherished Old Main and behind it is the first building on the college campus. Augustana College was founded in Chicago in 1860, as a school for Swedish Lutherans. A few years later, in 1863, it moved to Paxton, in east central Illinois, thinking that new Swedish immigrants would follow the route of the Illinois Central Railroad out of Chicago. However that movement did not happen, and the area was only lightly populated by Swedes. A more convenient location for the still young school was needed. This was determined to be at the great crossroads in Rock Island, where the railroad met the Mississippi River. These easy transportation routes would provide convenient access to the large number of Swedish immigrants settling in the region from here to Minnesota. The ornate Second Empire styled building was of frame construction atop a high stone foundation. It was U-shaped, with a prominent four-story section in front that featured a double-stepped mansard roof surmounted by an open 76 foot high bell tower. 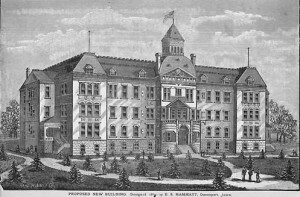 A pair of lower wings, also topped by mansard roofs, extended south toward the bluff on either side of the main structure. This building continued to serve the college in various capacities for decades, in its later years becoming a dormitory. It was demolished in 1935. Old Main, the iconic image for Augustana College, was originally called Memorial Hall. Its construction was a massive undertaking, requiring five years from the laying of the cornerstone in 1884 until its dedication in 1889. Even then, its dome was not completed until 1893. Two different designs were published in1884 by local architect Edward S. Hammatt. Both show a buildings which bears only a some or little resemblance to the one ultimately constructed. The architect credited with the final design is L. G. Hallberg of Chicago. The dome design was influenced by a similar building at the University of Uppsala, Sweden, the historic alma mater of most of the early Augustana faculty. Notice the power poles along the sidewalk in the picture. During the construction of Old Main, electricity and water were extended to the campus for the first time. The Renaissance Revival style of Old Main, which is listed on the National Register of Historic Places, is rare and distinctive. In Old Main, the college fathers clearly demonstrated that they were building for those many generations of students and faculty they knew would follow them. The massive walls of smooth and textured dolomitic limestone from LeClaire, Iowa, are a symbol of the college commitment to its permanent home in Rock Island. The postcard is also interesting in its depiction of the 7th Avenue of the time. Real Photo postcards tell the truth; they are not “prettied up” to hide flaws in the landscape. Although the stone retaining wall, the stairs, and the sidewalks along its edge appear the same as they do today, the street itself looks like a rough country road. It is unpaved, rutted and muddy, with grass lining the edges and even sprouting from the street itself. For many years, 7th Avenue was not the straight thoroughfare it is today, a continuous link through Rock Island. Just west of Augustana, near 33rd Street, the avenue was halted and turned aside by a large ravine. Through travelers between Moline and Rock Island were obliged to use 5th Avenue. It was not until 1907, that the Rock Island city council provided funds to pave this part of 7th Avenue and create a landscaped boulevard at its center at the same time. In 1911, the Union Streetcar railroad company is graded “College Hill” on 7th Avenue. Our postcard can therefore be dated as originating in the first few years of 1900. Although most of this scene has changed in the past century, Old Main still looks the same as it stands sentinel over Augustana and 7th Avenue. Thanks to a recent exterior restoration, still continuing on the inside, it will stand for another century and more. This article, by Diane Oestreich, is slightly modified from the original, which appeared in the Rock Island Argus and Moline Dispatch on March 13, 2005.